HP’s line of Spectre Ultrabooks and 2-in-1 laptops have always had gorgeous aesthetics and respectable performance with an approachable price tag. Now, after taking a step back and re-evaluating its Spectre offerings – the HP Spectre x360 especially – a redesigned case, more powerful hardware and an included stylus came into existence. In many ways, the new HP Spectre x360 rivals the Microsoft Surface Book 2 and Lenovo Yoga 920 in features and style – even if only the latter is a direct competitor when it comes to price. With the rejuvenated HP Spectre x360, HP has improved many of the buttons and the general design – even going so far as to include a microSD card reader. This is why, even in the face of lackluster battery life and an awkward keyboard layout – it’s easy to call the HP Spectre x360 one of the best 2-in-1 laptops. In the US, the HP Spectre x360 we evaluated is listed at $1,069 with what you see to the right. Through its website, HP also offers more affordable and far more expensive builds. The entry-level model of the x360 is currently priced at $989 for an Intel Core i5, 8GB of RAM, and a 256GB SSD. In Australia, the model we tested still isn’t available. Instead, you’re looking at a starting price of AU$2,399 with a Core i5 CPU and a 360GB SSD, topping out at AU$3,599 for a Core i7, 16GB RAM and a 1TB NVMe SSD. In the UK, HP offers the same range of options as in the AU – starting at £1,499 and topping out at £1,749. These prices are all competitive with the likes of the Lenovo Yoga 920 ($1,549, £1,349, AU$1,954) or Microsoft’s Surface Book 2 ($1,499, £1,499, AU$2,600), if not a bit more affordable to either model. A smooth, silver aluminum housing wraps the entire body, broken up only by shiny buttons or speaker grilles. The material reminds us of previous Spectre’s, which unfortunately means it will eventually show some wear and tear. On the left side of the laptop is a microSD card slot, a power button with embedded indicator light, a 3.5mm headphone jack, and a USB 3.1 port. On the right, you’ll find a volume rocker, fingerprint sensor, and two USB-C ports with Thunderbolt 3. There aren’t a lot of ports, but having both USB Type-A and USB Type-C is a welcomed approach to eliminating some of the pain that switching USB standards can cause users. 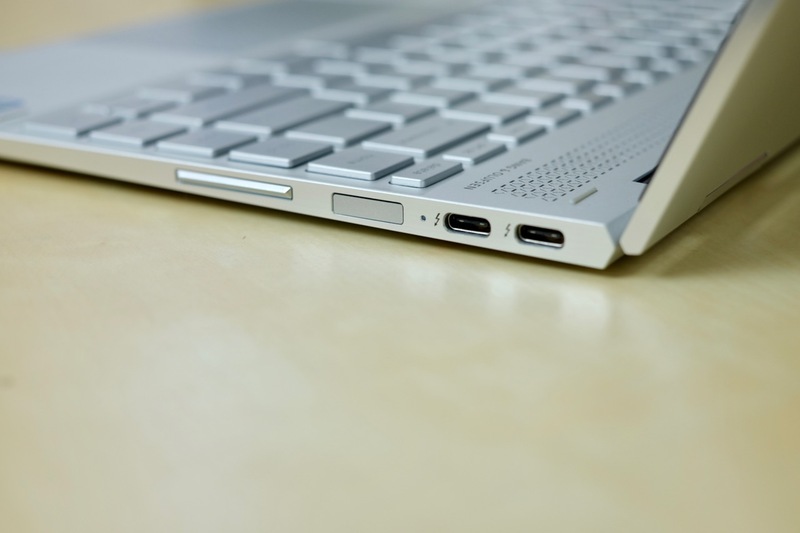 Either of the Thunderbolt 3 ports can be used to charge the laptop. Measuring 12.04 x 8.56 x 0.53 inches (30.6 x 21.8 x 1.36 cm), and weighing 2.78 pounds (1.26kg) the Spectre x360 is lightweight and compact enough to tote around. Once you open the HP Spectre x360, you’ll be greeted with a rather large touchpad that’s smooth to the touch and has a satisfying click to it. Above the keyboard is a rather compelling speaker grille. The design is visually appealing and allows more than enough sound to come through. Just above that speaker grille are two hinges that allow the Spectre x360’s display to rotate 360-degrees to go from laptop to tent to tablet mode. The hinges are smooth when moving the screen, but they do a bad job of holding it in place when tapping on the screen or typing away on the keyboard. Instead of reaching up with one hand to scroll through some text, we find ourselves using another hand to hold the Spectre x360’s display still while interacting with its touch interface. As part of reevaluating the Spectre x360 line, HP was able to shrink the bezels surrounding the 13.3-inch FHD (1,920 x 1,080) display. HP offers a privacy screen feature for an extra $60 in the US, but the unit we tested lacks this feature. The feature is supposed to eliminate coworkers or strangers from glancing at your screen and obtaining confidential information. 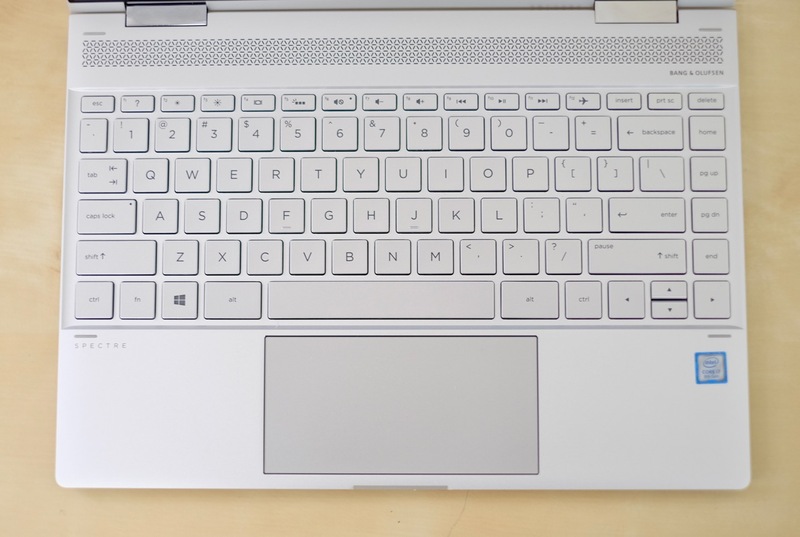 A full-sized keyboard sits just above the touchpad, only with an extra column of keys to the far right. The added keys serve as the Page Up/Down, Home/End, and a Delete keys. This row continues to give us problems, as our muscle memory when doesn’t expect there to be anything to the right of the Enter and Backspace keys. Compounding the confusion is the fact the right arrow key lines up with the added row, instead of with the Shift/Return/Backspace keys as is normally the case. Other than the added column of keys, HP has a winning keyboard. It’s smooth and the keys require little force for touch-typists. A welcome characteristic of the touchpad is just how wide it is. It’s longer than the spacebar, making it easy to interact with when needed. It has a reassuring click to it, and is smooth when using gestures to navigate Windows 10. Included in the box is an HP Pen. 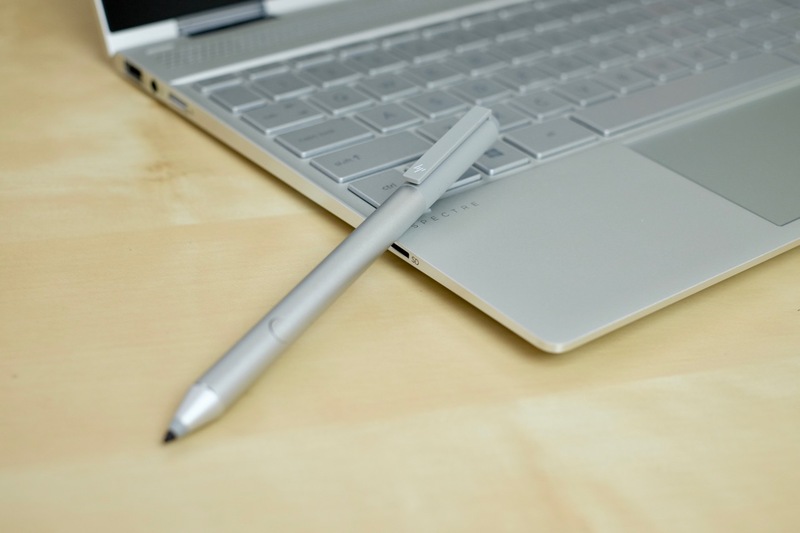 The stylus works with Windows 10 Ink for drawing stick figures or jotting down notes. In our testing, the stylus and Spectre x360’s interaction is seamless, with digital ink flowing from the pen with ease. You can lift the top of the pen to access a USB-C port used to charge it. Having a hidden charging port that doesn’t require sticking the end of the HP Pen into a port like the Apple Pencil, or removing the lid and replacing a battery like with the Surface Pen is convenient, and another win for the HP Spectre x360. Adding to the convenience is the fact that you can use the same cable you use to charge the x360. We’ve tested the x360 over the course of a couple of weeks, and find it to keep up with almost anything we can throw at it. Switching between laptop and tablet mode occurs quickly, without any delay or stuttering as Windows 10 switches between modes. Running several apps at the same time, from Mail to Chrome with multiple tabs and Slack, the Spectre x360 handles it all with ease. We don’t even remember hearing the fans kicking on for too long, or if they actually did, they were quiet enough to blend into the background. The Spectre x360 and its lack of a dedicated GPU won’t prove to be a gaming machine, but it’s still powerful enough to handle casual gaming. The Spectre x360 scored lower than the Yoga 920, and well below that of the Surface Book 2 on one of our benchmark tests, but that doesn’t mean it’s going to be a vastly slower laptop. In some cases, the scores were close enough that experiencing real-world difference in performance is unlikely. For example, with GeekBench scores for the single-core test of 4,625, 4,677, and 4,123 for the Spectre x360, Yoga 920, and Surface Book 2, respectively, are close enough to call it a tie. With the exception of the 3DMark score comparisons between the Spectre x360 and the Surface Book 2, the latter of which has a dedicated GPU compared to an integrated GPU in the x360, the Spectre x360 holds its own quite well. HP is proud of the Spectre x360’s battery life. On the website, it boasts up to 16 hours of use. While that may very well be the case with a minimal workload, we couldn’t quite get there. Both our looping video playback benchmark and our real world testing resulted in battery life just under 8 hours, or about half of what HP claims. Eight hours is plenty to get through a full day of work, no doubt – not to mention all flights across the US, Australia and western Europe. But, you’re not going to be able to work a full day and then go home and binge some Netflix without first hunting down the HP Spectre x360’s charger. At first, we were a bit puzzled by the fingerprint sensor. It looks more like a power button, or some sort of covered up port, than it does a biometric scanner. However, putting the fingerprint scanner on the side of the housing is great for easy access regardless of how you’re using the HP Spectre x360. When you’re in laptop mode, quickly resting your finger on the side feels completely natural. Conversely, if you’re using it in tablet mode, the fingerprint sensor is still readily available for signing into your account. The same can be said for the power button and volume controls — both of which are readily available regardless of how you use the Spectre x360. What we wish wasn’t readily available, however, is McAfee’s security suite. We are continuously prompted to finish the sign-up process for McAfee’s software, no matter how often we exit the app or try to tell it to leave us alone. It’s mind boggling that this software is still pushed on consumers in such a disrespectful fashion. Users don’t need to be reminded every couple of hours to sign up for a service. The HP Spectre x360 is one fine-looking laptop. It’s smooth appearance with polished highlights practically calls you to it. The fingerprint sensor tucked onto the side is convenient for use in any mode, and the stylus is included in the box. With an extra column of keys to the right of the Backspace, errant presses of a Home or Page Up key are all too common. While lengthy, battery life falls short of the 16.5-hour estimate. The HP Spectre x360 is a machine that’s full of surprises. Between a conveniently placed fingerprint reader and a touchpad that’s big and responsive, to a rather strange column of keys, there’s plenty to like and only a little to dislike. Overall performance is strong, and it’s a reasonably priced, premium-grade 2-in-1 laptop, especially when compared to the competition. Including an HP Pen is a nice touch, saving the end user a bit of money. 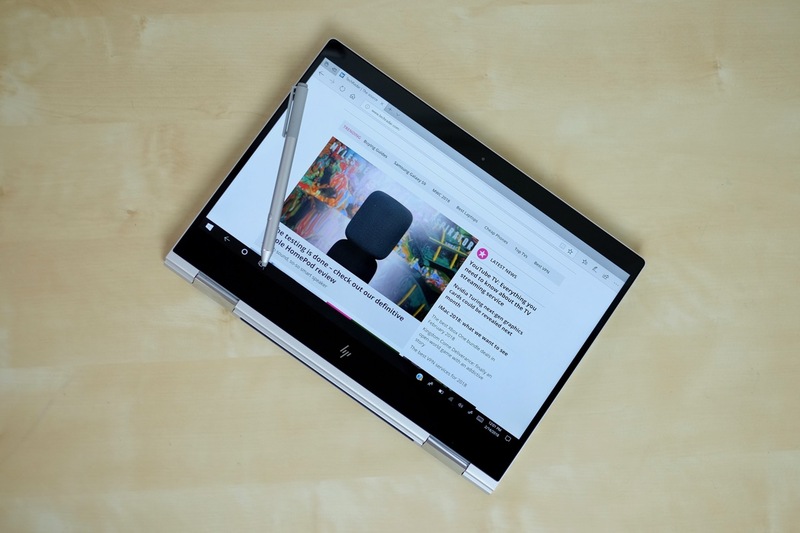 We have no problem recommending the HP Spectre x360 to those in the market for a 2-in-1 that has enough battery to get through a workday, and can keep up with everyday use.